To ensure the health and safety of our campus community everyone on campus is expected to comply with the following regulations and guidelines. 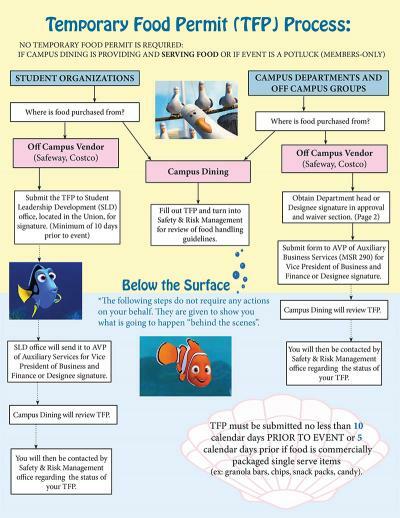 Food service on campus is regulated by the Stanislaus State Food Policy, California Retail Food Code (CalCode), with guidance from the Stanislaus County Department of Environmental Resources. Proper compliance with this process will assure liability coverage. To sell or serve food at an event please complete a Temporary Food Permit. Please note that Temporary Food Permit application must be submitted to the SLD Advisor or Auxiliary & Business Services no less than ten (10) calendar days prior to the event.